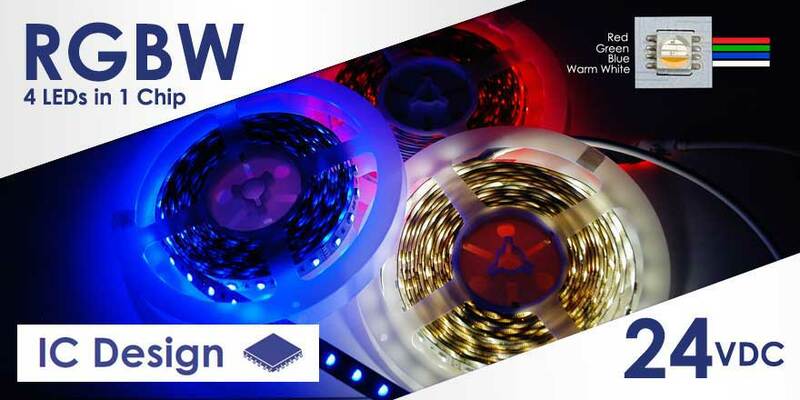 All new 24VDC RGBW features a new 4 in one 5050 SMD LED Chip and an integrated chip (IC) for current regulation. With current regulation, the RGBW strip will have less color shift on longer runs and the LED Chip will last up to 30% longer than regular RGB and RGBW strips. 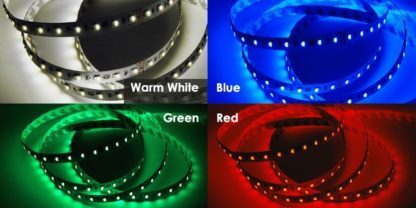 Standard 5050 SMD has three colors Red, Green and Blue but RGBW has Red, Green and Blue plus an additional color of Warm White (2700K +/-100K) to add to the wide color spectrum while creating a super bright LED strip! RGBW is different from the older RGB-W where each 5050 Chip has the standard three colors in one chip plus one separate 5050 SMD for white. This creates white spots and greatly diminishes the color mixing effect. The roll comes in a 6.56 ft(2 meter), 16.4 ft(5 meters) long roll in a flexible ultra-thin strip with a 3M adhesive backing. Use with LED World’s optional HUEDA™ DMX Color Controller. Note that this Type and is suitable for indoor use in dry location use. Comes with a peel and stick double-sided adhesive backing. 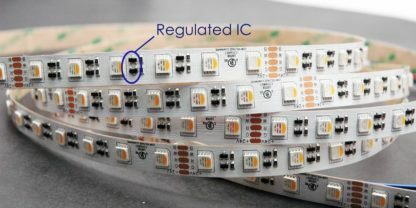 It is recommended to be installed in the optional Aluminum Channel (standard wide only) to extend the life of the LEDs. The FA60M50-5M-24V-RGBW comes with a five wire pigtail (50cm) 20″ long for easy connection to our optional color controllers. 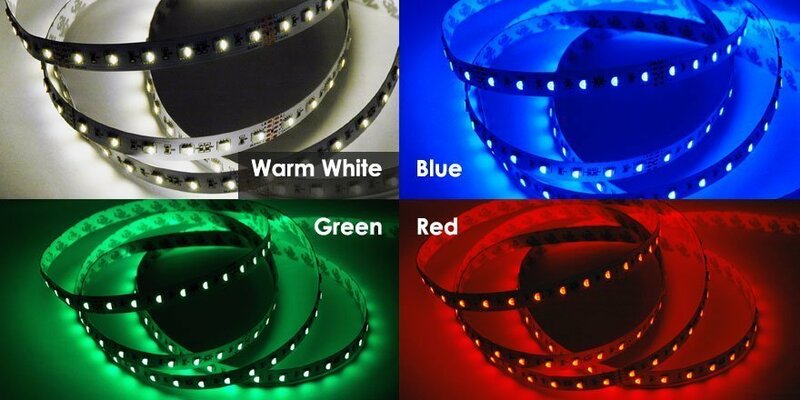 The LED strip can be cut to size at marked intervals, every 6 LED (24VDC). Please carefully read instructions before installing.